For 52 years, the Krugerrand has been sought after by investors and collectors who are drawn to its status as the original bullion coin as well as its proven track record. However, larger denominations can seem expensive. Why not choose one of the outstanding fractional coins such as this 2019 1/10 oz Gold Krugerrand which is now available at CoinInvest now? A classic reverse design of the springbok antelope, one of South Africa's most enduring national symbols. An obverse that bears the portrait of the country's former President and founder, Paul Kruger. The 2019 1/10 oz gold Krugerrand has all the elements that have made 1 oz Krugerrands an international success for 52 years. 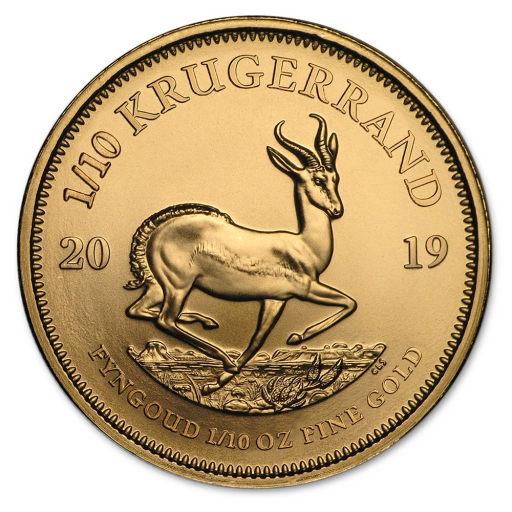 Since fractional Krugerrand coins were introduced in 1980, they have been just as popular, and the 2019 1/10 oz gold coin is no exception. Add the 2019 1/10 oz gold Krugerrand to your basket at coininvest.com and we'll ship it quickly and securely to your preferred address. Be sure to take a look at our full collection of gold and silver Krugerrands from various years.